NGM313 is a proprietary, monoclonal agonistic antibody selectively activating FGFR1c/KLB that we believe has the potential to be a once-monthly injectable insulin sensitizer for the treatment of both type 2 diabetes and nonalcoholic steatohepatitis (NASH). With approximately 17.5 million patients in the United States with type 2 diabetes and NASH, there exists a substantial unmet medical need for a single treatment that addresses pathophysiological states common to both diseases, including insulin resistance, lipid metabolism dysfunction and increased lipotoxicity at the level of the liver. In Phase 1 clinical testing, NGM313 has demonstrated favorable tolerability, and preliminary data has shown the agent is capable of reducing liver fat content and improving metabolic biomarkers in obese insulin resistant subjects with nonalcoholic fatty liver disease (NAFLD) after a single dose. Merck licensed NGM313 and plans to conduct a Phase 2b study to evaluate the effect of NGM313 on liver histology and glucose control in NASH patients with or without diabetes. NGM313 is a humanized monoclonal agonistic antibody, with the potential for once-monthly or less frequent dosing, that binds to a unique epitope of KLB, resulting in the selective activation of FGFR1c and signaling through the metabolic pathway utilized by FGF21-based ligand therapies. FGF21-based therapeutics have generated interest in the pharmaceutical research and development community because they represent a novel approach to treating multiple aspects of the metabolic syndrome; however, attempts by other companies to translate FGF21 into a product with clinical application have had limited success. It is thought that investigational FGF21-based protein therapeutics have produced inadequate glucose reductions due to a shorter than optimal half-life or counter-regulatory mechanisms triggered from activity across multiple receptor types. FGF21 exerts its effects by signaling through the receptors known as FGFR1c, FGFR2c and FGFR3c, but not the receptor known as FGFR4. KLB functions as a co-receptor to enhance the binding of these receptors and is essential for mediating FGF21 activity. FGF receptors are expressed on cells in many tissue types, but KLB is mainly expressed in fat cells and other tissues, such as the pancreas and liver. We believe that developing a specific, agonistic antibody that selectively activates the FGFR1c/KLB pathway would obviate the risks associated with therapeutics based on the native FGF21 ligand. 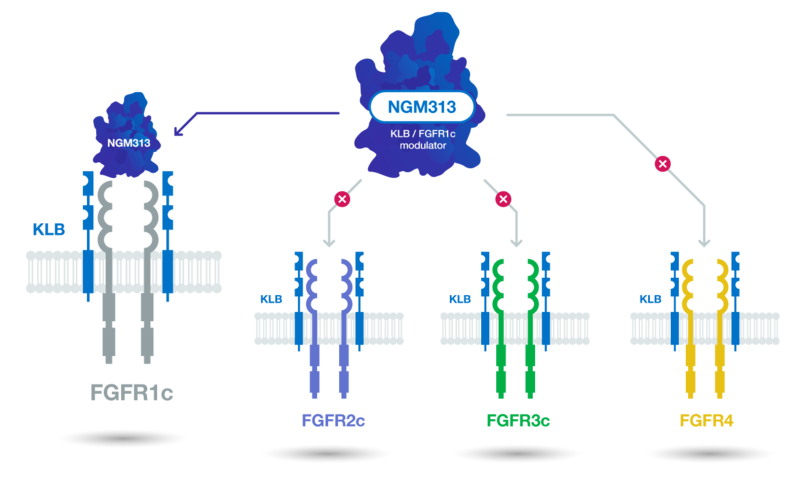 NGM313 exhibits highly specific binding with KLB, resulting exclusively in the activation of FGFR1c-mediated signaling: it does not trigger signaling through other FGF receptors, such as FGFR2c, FGFR3c or FGFR4. Type 2 diabetes is a common co-morbidity of obesity and NAFLD, and a disease in which the concentration of blood sugar is elevated due to an imbalance of insulin production from insulin-secreting beta cells in the pancreas and insulin action at the tissue level, known as insulin resistance. This causes damage to small and large blood vessels and, potentially, leads to blindness, amputation and kidney disease along with an increased risk of heart attack, stroke and premature death. Insulin resistance has been implicated as a key condition leading to hepatic steatosis and, subsequently, NASH. An estimated 65% of type 2 diabetes patients have NASH. The presence of diabetes is associated with worse liver disease and, in patients with NAFLD and NASH, type 2 diabetes is associated with more severe hepatic and adipose tissue insulin resistance, and more advanced liver steatosis, inflammation and fibrosis by liver histology. In addition, administration of insulin may increase steatosis, making the treatment of patients with type 2 diabetes and NASH challenging. The role of insulin resistance and hyperglycemia in the pathogenesis of NAFLD suggests that improving insulin sensitivity and normalizing glucose levels could prevent the development of NASH and progression of disease. Insulin-resistant patients that remain inadequately controlled often have NAFLD, low HDL cholesterol level and increased waist circumference, and are likely the best candidates for treatment with insulin sensitizers. Thiazolidinediones, or TZDs, such as pioglitazone and rosiglitazone, are a notable class of drugs that function as insulin sensitizers to potentiate the effect of insulin, improving glycemic control and dyslipidemia and, therefore, providing a valuable addition to diabetes therapy. However, the clinical use of TZDs has been limited by the risk of adverse events, including congestive heart failure, for which there is an FDA boxed warning, weight gain, peripheral edema/fluid retention, bone fractures and an association with bladder cancer for pioglitazone. We believe the introduction of an insulin sensitizer without the adverse effects and safety profile of the TZDs would provide a meaningful addition as combination therapy with incretins, with the goal of normalizing glucose levels in patients with type 2 diabetes. While numerous new drug classes are available, none target insulin resistance nor have the potential to resolve persistent hyperglycemia when used in combination with other available diabetes treatments. We believe NGM313 has the potential as an insulin sensitizer for use as monotherapy or in combination with other drug classes, like GLP-1 analogs, to halt the progression of, and potentially reverse, diabetes and NASH.